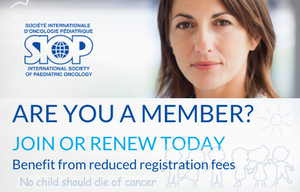 On behalf of the Board of Trustees of Childhood Cancer International (CCI) and the Congress Local Organizing Committee I am delighted to welcome you to the Annual SIOP Congress! As in previous years CCI is proud to be a participating partner at this event. Together you are a part of CCI's global network of 188 member organizations in 96 countries, all strongly committed to ensure that children and adolescents with cancer receive the best treatment and care wherever they may be. This year we are excited to celebrate the 50th anniversary of the SIOP Congress in Kyoto, Japan and it is only fitting that our annual meeting and annual general assembly is held in the country of one of CCI's founding members. We are thrilled to announce CCI's Opening Keynote Address will be given by HRH Sheikha Jawaher Bint Mohammed Al Qasimi, Wife of the Ruler of Sharjah, Founder and Royal Patron of the Friends of Cancer Patients Society (FoCP) – a member of CCI. Her talk will focus on Responding to the Challenges of Global Childhood Cancer. This will be followed by a panel discussion and a Congress program including keynote lectures, group and panel discussions, workshops, small group meetings, poster presentations and the opportunity for each of you to interact, share, grow and contribute towards a world that makes childhood cancer a global health priority. Enjoy the conference, Kyoto and its ancient beauty and the time spent with each other.